The Criterion Collection has released a box set of the films of Robert Downey Sr., including the 1969 classic (and Louis C.K. 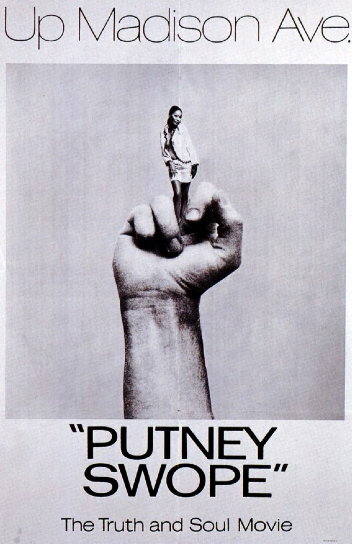 favorite) Putney Swope. That price is a steal. Speaking of steals: the work of women artists from the post-war era is remarkably cheaper than that of their male counterparts. If we can call $10.7 million cheap, that is. Starting tonight, the New Yorker’s fiction department (@NYerFiction) will be tweeting Jennifer Egan’s new story, which apparently contains only 140-character-or-less paragraphs. An homage to The Mountain Goats unfortunately was cut from the title of The Mighty Thor #14. “Kind of like Fassbinder’s Berlin Alexanderplatz, but with pirates and whores and venereal disease and bumptious alcoholics and someone in almost every episode soiling his or her (usually his) pants. In other words, almost exactly like Berlin Alexanderplatz.” James Greer, everyone, on the work of John Barth for the LA Review of Books. Gosh, we love that guy. If you didn’t get a chance to goof around with the Robert Moog-themed Google doodle earlier this week, here’s your chance. And finally, the happiest of birthday wishes to Roseanne Cash and Bob Dylan.